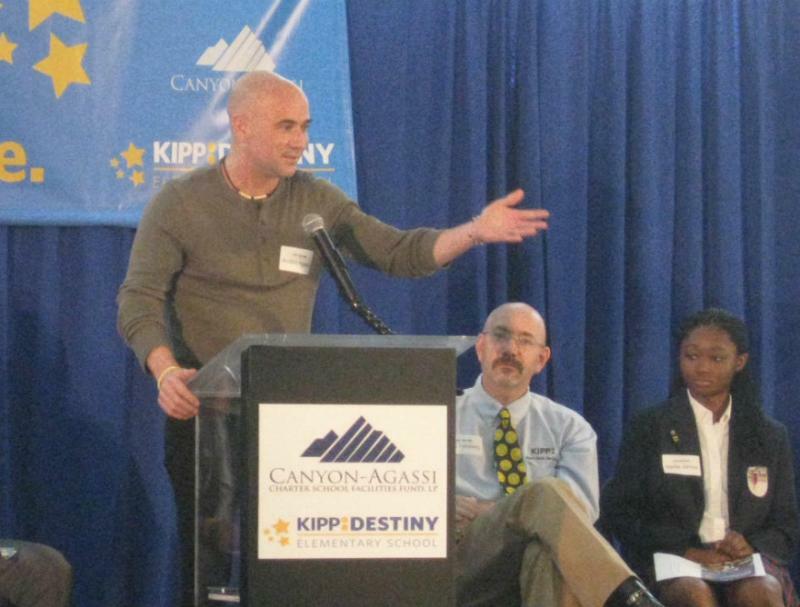 Andre Agassi, at KIPP Destiny charter school in Dallas' Red Bird Area. Some of his millions helped convert the former department store into a school. Former tennis champ Andre Agassi lent his star power to officially open a Dallas charter school Wednesday. The star also contributed millions from his education fund to launch the KIPP Destiny elementary school. In a renovated auditorium that used to be part of a Mervyn’s on West Camp Wisdom in Dallas’ Red Bird area, Andre Agassi told a room of charter school parents, teachers and donors he was lucky. So nearly 20 years ago, Agassi created a non-profit foundation for children. A dozen years ago he opened a charter prep school in Las Vegas, where he lives. And more recently he partnered with KIPP, because he says it's a top tier charter school operation. Agassi has nothing against public schools, which charters are, technically. He just doesn’t see them changing or innovating fast enough to serve thousands of kids and parents who want more options. Brenda Jones is a parent who jumped at Dallas’ KIPP school after she heard about it on Oprah. She came up through DISD and liked her schools, but says things changed over more than 20 years. “Teachers didn’t’ care. I didn’t see the quality of education coming out of DISD that I had previously seen when I was attending school,” Jones said. She’s happy with KIPP. SMU Cox Business School professor Dan Howard says KIPP must feel the same way about Andre Agassi. Agassi says he’s in it for the long haul. He says his foundation has helped build two KIPP schools. He wants to build a hundred. So he says there are 98 to go.